SOUTH BEND, Ind. (AP) Mike Brey believes his 2017-18 team can go where only one Notre Dame men’s basketball team has ever gone before. ”We’re driven by our senior class to play in a Final Four,” said Brey, whose 18th Notre Dame team begins its regular season Nov. 11 against DePaul at Chicago’s new Wintrust Arena. The 6-foot-6, 224-pound Colson, a first-team all-ACC selection last season after averaging 17.8 points and 10.1 rebounds, is the preseason pick to be the league’s Player of the Year. He’d like to end the season in San Antonio for a shot at the national title. So does the 6-foot-1 Farrell, who started all 36 games last season for Notre Dame’s 26-10 team that went 12-6 in ACC play. ”I told my staff after he got back (that) his confidence has never been higher, and darn if I’m going to do anything to screw that up right now,” Brey said. D.J. Harvey, a 6-6 + prep All-America guard/forward, is the latest graduate of DeMatha Catholic in Hyattsville, Maryland, to make his way west to Notre Dame. Brey and assistant Rod Balanis played for legendary DeMatha coach Morgan Wootten. Over the years, the Stags have sent Bob Whitmore (1966-69), Sid Catlett (1968-71), Adrian Dantley (1973-76) and Jerian Grant (2011-15) to Notre Dame. Notre Dame led the nation in free-throwing shooting last season at 80 percent. Despite losing Steve Vasturia (91 percent) and V.J. Beachem (83.6), Brey has seen improvement in the preseason and believes the Irish will be close to the top again with the return of Colson (78.3), Farrell (79.4), T.J. Gibbs (83.1) and Geben (76.7). 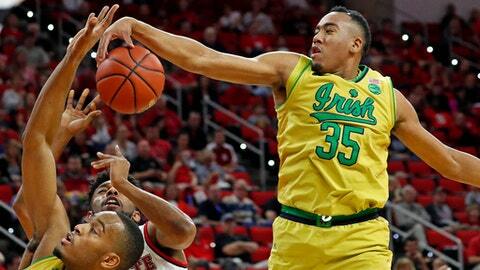 Plus, Notre Dame had an assist-to-turnover ratio of 1.66, second to UCLA’s 1.91. Beginning his 18th season at Notre Dame, Brey’s 382 victories rank second all-time on Notre Dame’s coaching list to the 393 for Phelps from 1971-91. Phelps, a former analyst for ESPN, maintains his home not far from the Notre Dame campus and regularly visits practices.